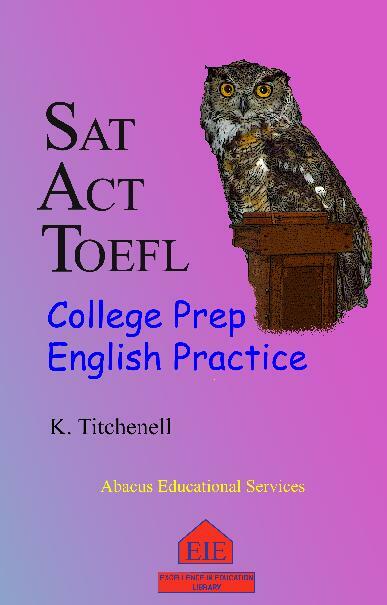 SAT, ACT, TOEFL College Prep English Practice is not about test-taking as much as improving those English verbal skills being tested – as quickly, efficiently, and enjoyably as possible. Each chapter begins with a whimsical story whose highly concentrated vocabulary is presented in a memorable context with side-by-side glossary. There follow comprehension quizzes, language analysis, practice worksheets and suggested writing projects. College Prep English Usage goes beyond simply teaching grammar, style and vocabulary. It trains the reader to determine current English language usage – with a mouse-click and a few keystrokes – far more readily than would be possible with any style or grammar manual, and to learn to emulate the English that dominates on the Net or in any specific interest area or region, particularly the academic realms, through quantitative analysis of targeted searches. An atmosphere of playfulness and frivolity is maintained throughout – in the stories, exercises, grammar examples and suggested projects. CPEP is an update and expansion of SAT Practice: The New Verbal Section (See below), which treated specifically the SAT exam of 2005 and has been used extensively in homeschooling environments. For a deeper picture, use the Look Inside This Book feature on the Amazon page. English vocabulary, usage, comprehension, grammar and composition preparation for the New SAT, TOEFL, AP and similar examinations requiring English reading and writing skills. Reading selections incorporating SAT vocabulary with side-by-side glossary are followed by comprehension quizzes, grammar quizzes, extensive glossaries with synonyms and word variants, English usage notes, and suggested projects. Appendices, comprehensive glossary, and index. Highly erudite lunacy. This book is a lot more fun than the others. The Advanced Writing Class for Homeschoolers at EIE and online uses the SAT Practice text. Online-only students welcome. Free online writing style and grammar resources for English classes and homeschooling excerpted with permission from SAT Practice, The New Verbal Section. Vocabulary List excerpted with permission from SAT Practice, The New Verbal Section and Vocabulary Crossword Puzzles based thereon. Annotated List of SAT Resources on the new SAT The BIG LIST with comments and prices when available. SAT Vocabulary Books Classics, mysteries and other works incorporating SAT level vocabulary. Recommended Children's Books Reviews, Excerpts, Downloads, Bookstore links. Our personal favorites, mostly free for the download, these are works for children which demonstrate the English language at its best. There are many books and sites claiming to prepare students to take the SAT by exploiting flaws inherent in standardization, and some of these strategies havfe some value. However, the key to a high score is a working knowledge of crucial SAT test taking skills combined with a sound understanding of the subject matter being tested. 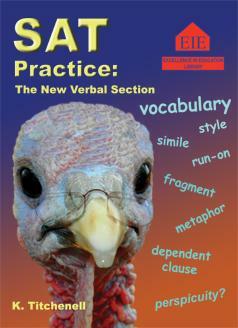 SAT Practice: The New Verbal Section is not about how to take a test, but about improving those English verbal skills being tested -- as quickly, efficiently, and enjoyably as possible. The comprehension and grammar quizzes emulate those used on the SAT expanded verbal section and suggested composition projects help you prepare for the infamous writing section.